Government and the GTU yesterday agreed to set up a high-level task force to address negotiations on teachers’ pay and conditions, averting a strike that had been planned for this week. For now Guyana’s teachers will receive the same increase as other public servants however, the Guyana Teachers’ Union (GTU) is hoping that the two-year anniversary of the submission of its multi-year proposal – December – will find its members with a better deal. “We have the major players in the pond right so what we are asking teachers to do is be patient for just a little while longer so that we can work through this process and see what it yields,” McDonald said. McDonald was speaking after a meeting between President David Granger and a delegation from the GTU at State House yesterday. The meeting was held to discuss the way forward with regard to negotiations between the Government and the Union. Negotiations broke down last Thursday after Minister of Education Nicolette Henry told the union that government could only offer wage increases in keeping with those offered to public servants. In response to Henry’s statement, the GTU delegation walked out of the meeting and called on its teachers to stay home on Thursday November 2 and Friday November 3. The strike action was put on hold after President Granger asked to meet the union and assured that the collective bargaining process would be pursued. Yesterday, the delegation was assured that Henry was premature in her declaration. They were also told that despite the MoE being in receipt of the union proposal since 2015 the only issue taken to cabinet in relation to teachers was a request to have the de-bunching payments agreed to in 2006 paid out. This request was taken by former Minister of Education Dr Rupert Roopnaraine. Today, Minister Henry will take to cabinet not the teachers’ proposal but the issue of the composition of the High level Task Force which is expected to facilitate negotiations. “During the meeting the two sides agreed to the establishment of a High -Level Task Force comprising on one hand, representatives from the Ministries of Education, Finance, Communities, Public Service and Presidency and, on the other hand, representatives from the Union. The Task Force is expected to be constituted by Wednesday, November 1, 2017,” a joint press statement from the government and the GTU explained yesterday. The statement further noted that at its first meeting the Task Force is expected to establish timelines for its sessions and the completion of its work. McDonald is hopeful that this timeline will not extend beyond the end of November and is certain that the union will not allow the present stalemate to continue to the end of 2017. Additionally, the statement said that the GTU “has agreed to provide a complete dossier of its financial and non-financial submissions by Wednesday, November 1, 2017.” McDonald notes that this submission will be the same as that previously submitted. 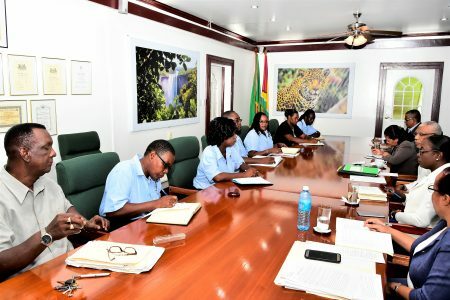 Asked if the proposal had not already been submitted to the various Ministries as previously reported, McDonald said that while the GTU had sent copies to the Ministry of Finance and the Ministry of the Presidency the expectation was that the subject Minister would make representation at the level of Cabinet and this did not happen. “They told us they received nothing,” she stressed, adding that the Task Force will also address issues such as adequate housing for those teachers assigned to interior locations and scholarship programmes. The statement explained that this agenda was decided in line with a suggestion from President Granger who proposed that the task force take a holistic view on the improvement of the education sector.